The set consists of three pieces, Gillette Mach 3 razor, shaving brushand a razor and brush stand. The whole set is nickel coated. The razor is triple-razor and gives a very close shave. It is medium-weight and a well-balanced razor and brush. The 100% pure Badger shaving brush forms amazing lather making the shave a very smooth one. The brush provides a massaging effect and also exfoliates the skin. It comes in a smart package of Edwin Jagger. It looks very elegant and thus acts as a decorative item in the bathroom, or perfect as a gift. The price of the product is around £45. Thus, Edwin Jagger shaving set has got a couple of good features. But the review of any product always depends on its pros and cons. It is of high quality. The brush is made of pure Badger hair. Badger hair creates a better lather than synthetic. The nickel coating makes the set elegant and adds an eye-pleasing effect to the bathroom. It is designed to be left on the counter for its aesthetic appeal when not in use. The brush produces a lot of lather, and helps massage and exfoliate the skin, making it clearer. The item can be shipped all across the world. The price of the product is on a higher end which makes it less affordable. Comes with a limited number of Gillette Mach 3 cartridges, but most straight razors require you to buy replacement cartridges. As with the disadvantages of wet shaving using it, we must say that it might give cuts or razor burns if not used properly. 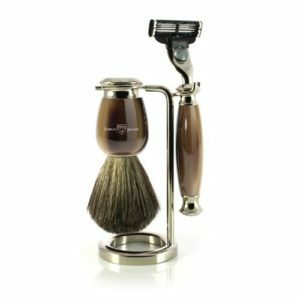 Based on the features of the product, it can be derived that the product is a good shaving kit. It is primarily meant for wet shavers. It also comes in a couple different options of ivory and nickel, or ebony and nickel. The reviews are 4.7 out of 5 with 94% of them over four stars.